In the past month, the Brigham Young University Family History Library has uploaded 22 new videos, averaging almost one a day counting the days the Library is open to the BYU Family History Library YouTube Channel. The uploaded videos fall into two distinct categories: webinars lasting about an hour and shorter instructional videos lasting about 10 to 15 minutes. The shorter instructional videos are used to teach the missionary staff of the Library. The longer webinars are live broadcasts which are recorded and uploaded. 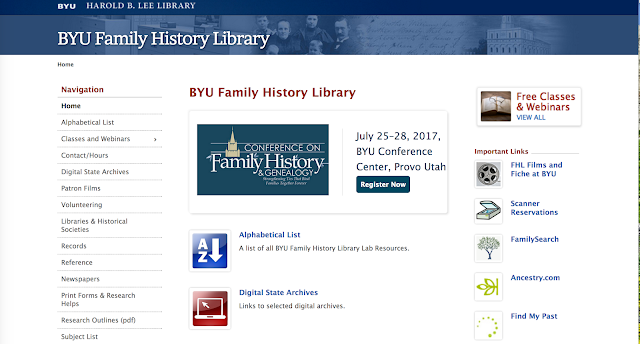 The webinar broadcast schedule is available online from the BYU Family History Library webpage. There is a link to the webinars and classes in the upper right hand corner of the webpage. 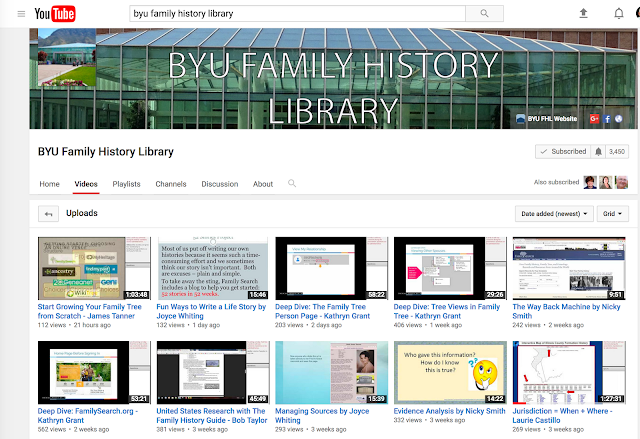 The BYU Family History Library YouTube Channel was opened about three years ago. Only about 20 videos were uploaded during the first year. During the second year of operation, the Library began incorporating videos of live presentations and classes. However, the technical difficulties of recording live classes resulted in a reappraisal of the process. Eventually, the videos were converted entirely to slide presentations recorded directly. As a result, the quality of the presentations improved. About a year ago, the Library acquired the equipment and programs to begin broadcasting live webinars. The Library also funded hiring student help in presenting the webinars. One of the biggest challenges has been scheduling webinars around the University's academic schedule. Over the past year, quite a number of people have volunteered to produce both the webinars and the instructional videos. YouTube is not particularly known for providing genealogical support, however, nearly every major genealogical website has a corresponding YouTube channel. What is unusual about the involvement of the Brigham Young University Family History Library YouTube channel is its sponsorship by a university library. There are quite a few YouTube offerings by University libraries but they focus primarily on library orientation and library databases with a sprinkling of library tours. However considering the number of colleges and universities in the world, the actual online presence of university libraries is relatively small. In addition, genealogy is not exactly a hot topic on YouTube. Many YouTube videos garner more than a million views matter of hours and even many instructional videos have hundreds of thousands or even more than a million views. The demographics of genealogists is such that it is unlikely that genealogy will ever achieve star status on YouTube. We have a full schedule of videos planned in the coming weeks and you can be assured that there will be many new videos uploaded. Response to Should Cursive Handwriting Die? Many of my own ancestors did not know how to write. The direct evidence of their lives is an "X" mark on a deed or marriage record. Today, the ability to communicate by voice and text is almost universal although there are still pockets of humanity that do not have the tools of communication. When I was very young, I lived in a small isolated town. Our only form of communication with the outside world besides handwritten letters was a rudimentary telephone system. I had virtually no contact with relatives who did not live in the same small town. Today, in a matter of seconds, I can connect with any one of my seven children's families and, if we care to do so, see and talk to them as if they were sitting in the same room. We often have feelings of nostalgia for conditions in the past. In many ways, my early childhood in a small town has some very appealing characteristics, but in longing for the past, we tend to skip over the problems and challenges that were inherent in what was comparatively a primitive society. For example, when we got sick, there were no Urgent Care facilities, no doctors without hours of travel and no drugstores with an array of medications that actually worked. From a genealogical standpoint, we sometimes wring our hands over the loss of the ability to write in cursive. I have written several posts over the years about the fact that cursive is no longer universally taught in our schools in the United States. Very few children today are comfortable writing at all much less writing in cursive. But let's take a quick check at a genealogical reality: none of us initially have the background to read handwriting from 100 or 200 years ago. We all have a steep learning curve if we reach the point where we do research into old, handwritten documents. In my small town, everyone knew how to ride a horse. I have a number of photographs showing my grandmother, who died long before I was born, riding a horse. People still have horses and still ride them, but few have a horse as their only method of transportation other than walking. Personally, I do not care to ride horses. I have done a lot of horseback riding even for extended periods of time and I do not nostalgically long for the days of horseback riding. For me, horseback riding was painful and unappealing. I am certainly not taking the position that quantity equals quality. But to take the attitude that poetry and all of the world's literature will die simply because we cannot write by hand is a little bit silly. It is also a long stretch to claim that we will all become stupid because we do not learn to write by hand. How much of the world's literature was lost in the past because of the time-consuming effort it took to write it all out by hand? What about the ability to "read old cursive handwriting?' Here is an example of some very good handwriting from Entre Rios, Argentina in the 18th Century. You can click on the image to see it larger. "Argentina, Entre Ríos, registros parroquiales, 1764-1983," database with images, FamilySearch (https://familysearch.org/ark:/61903/3:1:9396-CH46-5?cc=1974185&wc=M8JT-2M3%3A256498401%2C256498402%2C256498403 : 19 May 2014), Paraná > Nuestra Señora del Rosario > image 2 of 386; parroquias Católicas, Entre Ríos (Catholic Church parishes, Entre Ríos). Are you able to write in cursive? 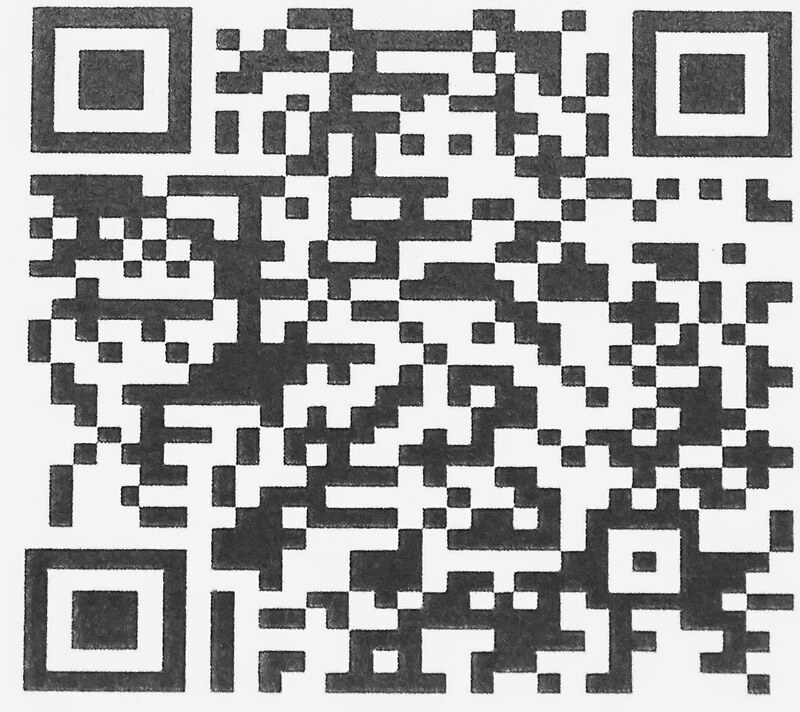 Can you read this text? Learning to read old documents is a different skill from writing in cursive. Just because you learned to write cursive in school does not mean you can read. Reading and writing are two different skills and reading in a language that is not your own is an additional skill. Even if you know the language this text was written in, it would still be a challenge to read it. This example points out a simple fact: the ability to do genealogical research is a challenging skill that must be learned. Learning to write cursive conveys no special abilities to those who are trying to read old handwriting in a language they do not know. Genealogists may be more aware of the loss of the skill of cursive writing in today's schools, but to assume that our society will collapse because of this one skill makes no sense. Without skills in writing and reading cursive, how can future generations read such important and carefully preserved original documents as the Declaration of Independence and the U.S. Constitution? When was the last time you read the U.S. Constitution in its original form? Have you ever read the U.S. Constitution in its original format? I must admit that even though I have taught college courses in Constitution Law, I have never actually read the entire U.S. Constitution in its original handwritten form. Why would I need to do so? 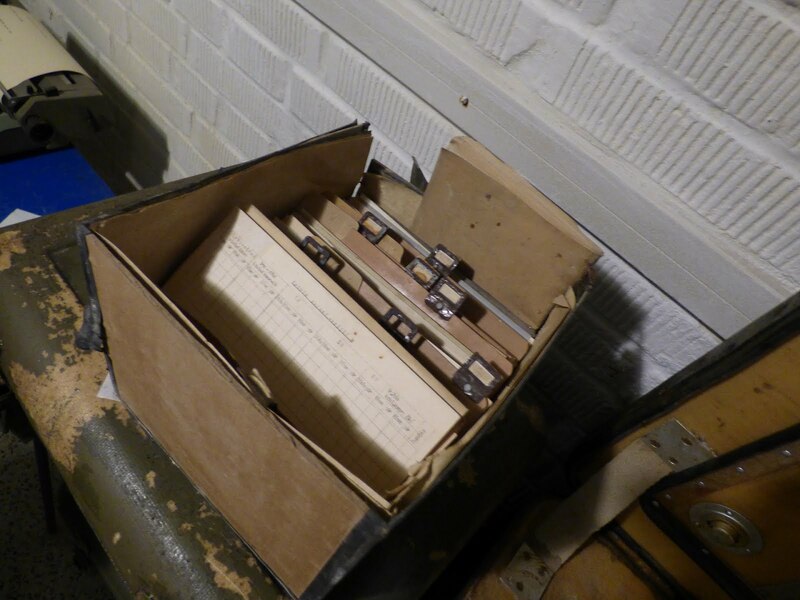 Family heritage is preserved in handwritten records. Nonprofit FamilySearch International’s free online databases of historical documents relies [on] more than a million online volunteers who read digital images of handwritten documents from all over the world, identifying formal names and critical facts to make the digital images easily searchable online. “We are heavily dependent on individuals who can read not only handwriting, but variations of older cursive writing used over time in over 100 languages,” said Collin Smith, FamilySearch indexing manager. 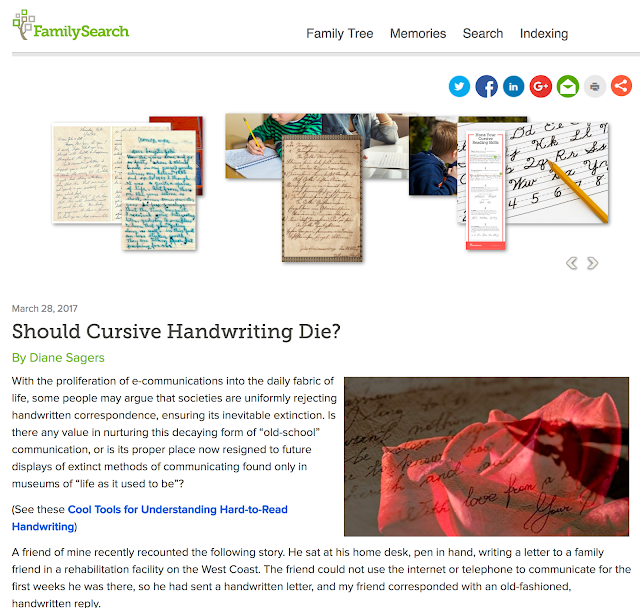 While fewer people are currently learning cursive, Smith noted, many tools and handwriting tutorials can help volunteers of all ages learn to read old styles of handwriting. Hmm. What is there that is fun and easy about genealogy? By the way, when was the last time you read a Browning sonnet either the original handwritten document or even a printed version? 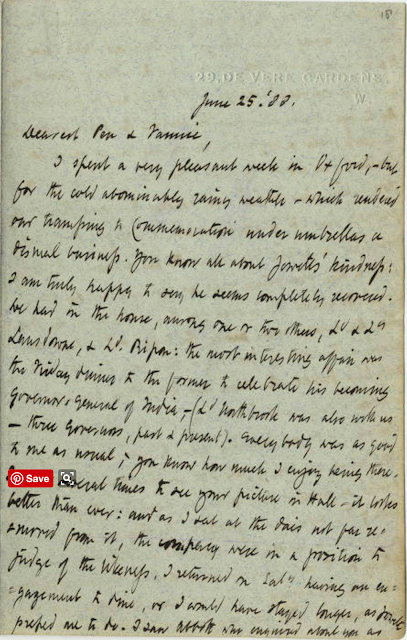 Have any of the original Browning manuscripts even survived? The answer is actually, yes. 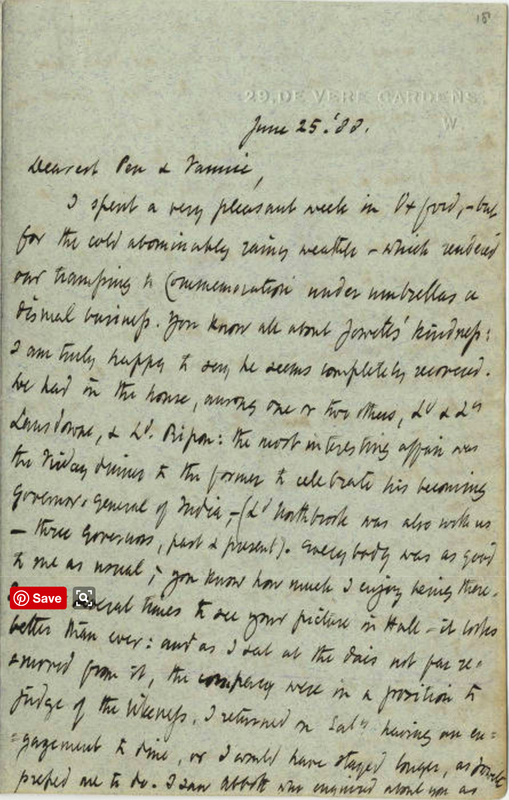 Here is a sample of Robert Browning's handwriting. Can you read it? My point exactly. What ever happened to Family Tree Maker? 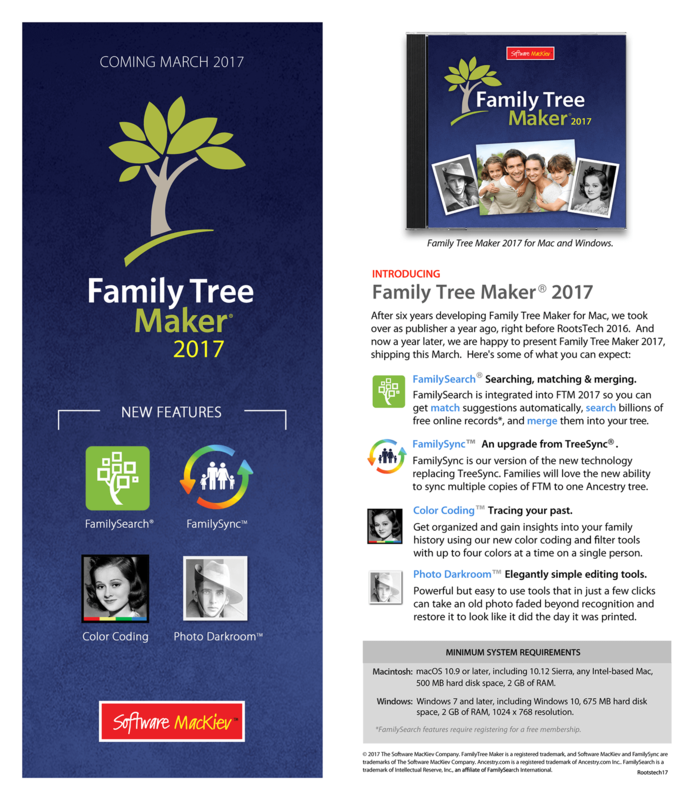 For some time now, the Family Tree Maker program has been among the most popular programs for recording personal genealogical research. In the past, it is been sold through mass merchandise such as Costco. The program was developed and sold by Ancestry.com. Over a year ago, Ancestry.com discontinued selling the program and eventually at the end of 2016 discontinued support for the program. However, just over a year ago rights to the program were purchased by a company called MacKiev.com. 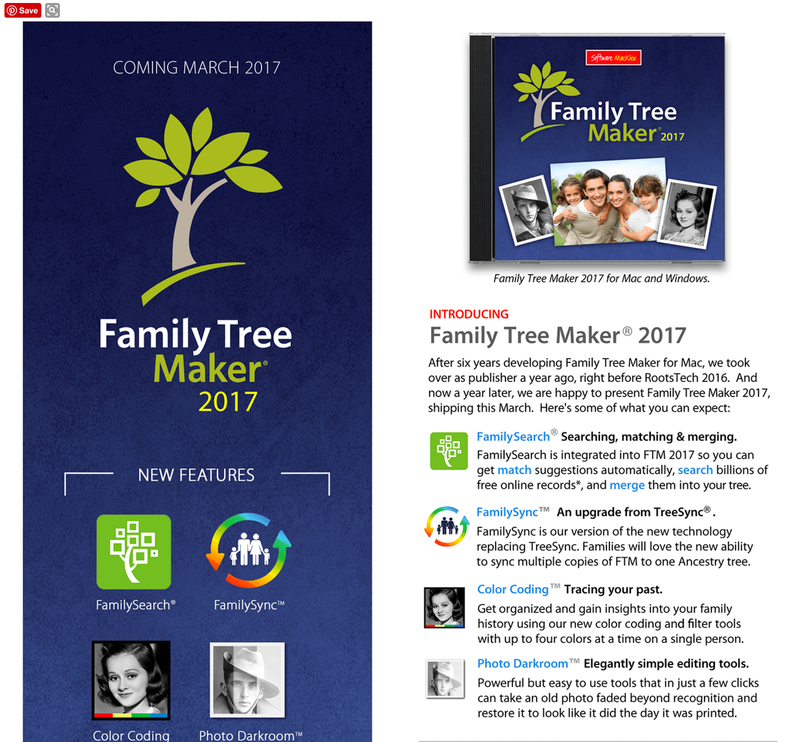 Just recently, MacKiev.com released a new version of the popular Family Tree Maker program. Here is a link to a description of the newly updated program. The question of privacy seems to arise frequently in the context of what is what is not private when putting genealogical data online particularly in public family trees. To start out, most if not all of the online family tree programs have provisions to hide information about living people. 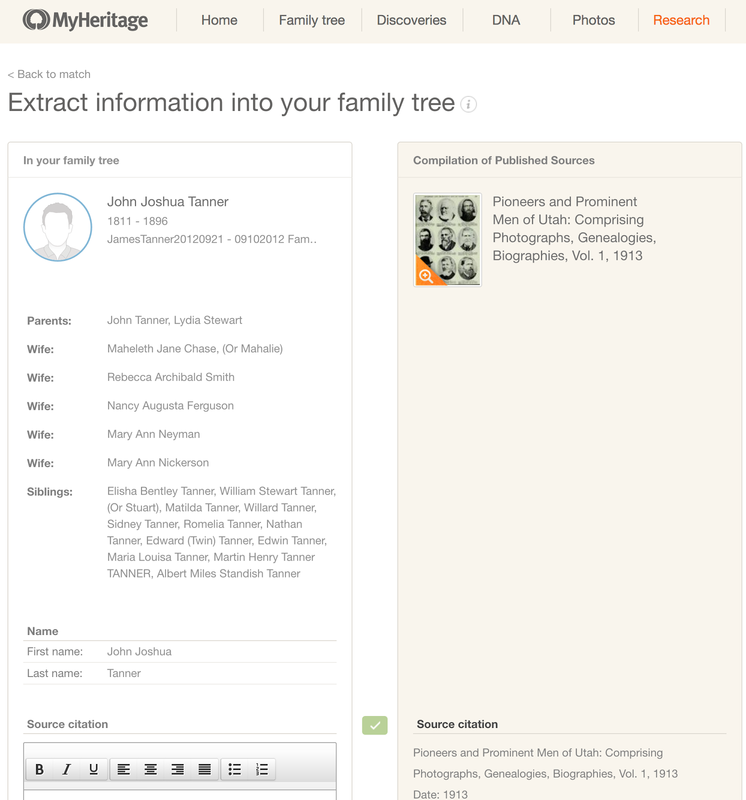 For example, the FamilySearch.org Family Tree program creates a "Private Space" for all living contributors. Anything created for a living person is hidden from public view. In addition, any individual added to the Family Tree without a death date or marking deceased will not appear or be visible to anyone besides the person who created or entered the individual. Notwithstanding these safeguards for living people, many potential contributors are afraid to add even basic vital information about living people. In the case of the FamilySearch.org Family Tree, as I already indicated, none of this information about "living" people is visible to anyone except the main contributor. There is one exception where living people in photographs may become visible to the general public if a dead person in the photo is tagged. At least in the United States, there is a substantial disconnect between what is considered private by individuals and what actually turns out to be private. The entire subject of "privacy" is controversial and very political. In the process of writing this post, the following news post appeared, "The House just voted to wipe away the FCC’s landmark Internet privacy protections." Because this post uses the word "privacy" you would tend to believe that it concerns what you consider to be "privacy." But in thinking this, you would be wrong. The issue really involves differing political opinions about the government regulation of internet service providers. On any given day, there is probably an online news story that involves some issue about "privacy." The reality is that the degree of isolation people could maintain when they lived on farms and there were no methods of communication other than writing letters and the spoken word have long since disappeared in almost the entire world. Let me give an example. You live in a house or an apartment. Do you receive mail from the U.S. Post Office? Is your home address public or private? Have you ever received a birthday card or letter? If you work, does your office celebrate or acknowledge your birthday? Have you every obtained a driver's license in the United States? Did you have to fill in a form that asked for your date of birth? Have you ever gotten any medical treatment in the United States? When you got a vaccination or obtained some medicine, did you have to tell the provider your name and birth date? What makes you think either your physical home address or your birthdate are private information? I will examine each of the three major types of vital records and indicate what is and what is not private. Names, dates, and places are the basic building blocks of genealogical research. Contrary to common belief, information about vital records is entirely public in the United States. Since the early 1900s, birth registration has been universal in the United States. I routinely obtain the birth and death information about my ancestors. It is only slightly less complicated to find the birth information about anyone living today. For example, how many times have you seen birthday greetings on Facebook? It is just silly to think that birth information in the United States is private information. Many newspapers routinely publish birth information and people send out birth announcements to friends and relatives either my traditional mail or online. When a child goes to school in the United States, they will need a birth certificate to prove eligibility. There is nothing private about birth information. Marriage records are even less private than birth information. If you buy or sell any property in the United States you have to identify your spouse and usually, the spouse has to sign some sort of document. This is the case because marriage affects property interests. Do not assume that because a state or local agency will not release information about a birth or marriage to anyone on demand that the information that this has to do with privacy. The main reason is that the agency charges and fee for the information and they want to protect the revenue stream. Some types of official documents are restricted because they can be used for illegal purposes. There is even less "privacy" about a death in the United States. Have you ever attended a funeral and been given a funeral program. I happen to have dozens of these programs that I routinely use to post death information to my genealogy files. Obituaries are published in newspapers even in this age of online news. Cemeteries are certainly not private and headstones can be viewed by anyone who wishes to drive or walk to a cemetery. These short illustrations are only the beginning. Are tax returns private information? We hear a lot of news about public figures being forced to disclose their tax returns. Does this make the returns private? No. You file your Federal tax return with the U.S. government. How private is that? Do you really know who can and who cannot see your tax return? I could go on and on, but the idea that the information gathered by genealogists is somehow private is ridiculous. Here are some simple rules about what is and what is not private information. 1. If anything about you can be obtained by searching the internet or paying a fee to a government entity, that information is not private. 2. If you tell anyone about something that you consider to be "private" then that information is no longer private. 3. If you engage in any publicly available activity, then what you did or how you obtained access to that activity i.e. going to the doctor or buying something in a store, is not at all private. 4. Any information that can be obtained through legal action in the United States can not be considered to be private. This list could also go on and on. Privacy is a bugaboo. People are unduly concerned about their privacy because they do not realize how little there is about their lives that is truly private. Genealogists become accustomed to searching for names, dates and sometimes places. This focus on specific information about their ancestors and relatives often prevents them from realizing the need to expand their research into the greater historical context of the time and place where their ancestors lived. For this reason alone, searching in the online documents, photos and other material on a website such as the New York State Archives seems for many researchers to be a waste of time and effort. A quick search for ancestral names that does not produce an instant link to a relative means that they need to move on to another venue. I can go to any one of the large online websites that host family trees and look through hundreds of entries and I will almost never find a source reference to anything other than the standard census/vital records type information cited by any of the contributors. It is like the researchers are playing a game of baseball with their research, as long as they circle the bases and touch each base, they are home free. When I start talking to patrons in the Brigham Young University Family History Library about maps and history, they get nervous and start asking when I am going find their ancestor. To most, there is only one way to play the game and I am not following the rules. 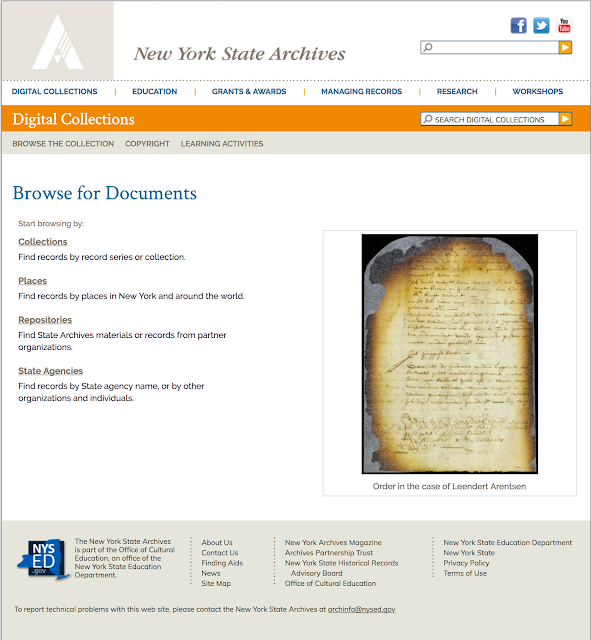 The New York State Archives is a good example of the broad, eclectic type of collections found in historical archives. It may not be immediately apparent to an inexperienced researcher that valuable information about their ancestral families may be embedded in the seemingly random collections. 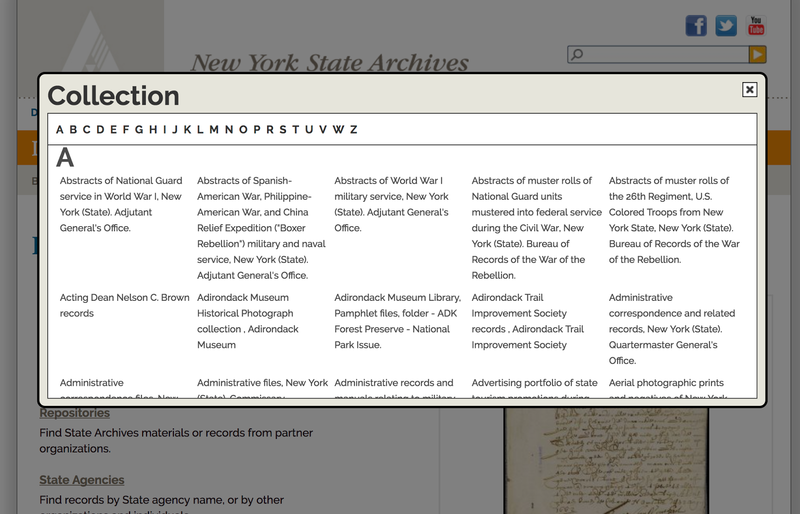 For example, I searched in the New York State Archives for my Tanner surname and found only four seemingly unrelated documents. But my direct line family, the Tanners, lived in New York for many years and it is likely that some of their descendants still live in New York state. So what else should I be doing? The key here, as it always is when this question arises, is to broaden my search. I need to be searching for all sorts of categories of documents that might contain information about my family. For example, my Great-great-grandfather Sidney Tanner was born in Greenwich, Washington, New York and lived in Bolton's Landing on Lake George. What would happen if I started searching for documents about these places for a start? The first thing I found was a map of the Champlain Canal Survey for Greenwich showing the names of property owners along the route fo the canal. Do I know where in Greenwich my ancestor lived? How do I know that one of these maps does not show his property? The answer is that I don't. But I would also have to search for other family names in order to determine if this particular set of maps applies to my family. 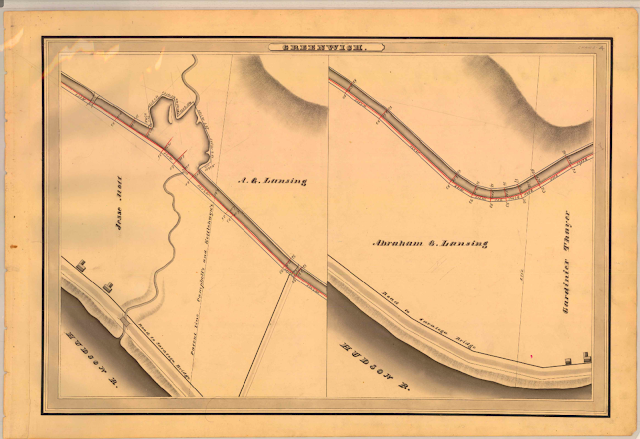 Likewise, here is a map of Bolton Landing, where my third great-grandfather owned a huge tract of land. One of my ancestral families lived and stayed in New York, the Stewart family. I found many more items linked to the Stewarts than I did for the Tanners. But then there are searches to be made for the places where they lived and their occupations and their schools and on and on and on. How many more subjects can I search on? What will I find? Those are the questions you need to be asking yourself when you are researching in depth. 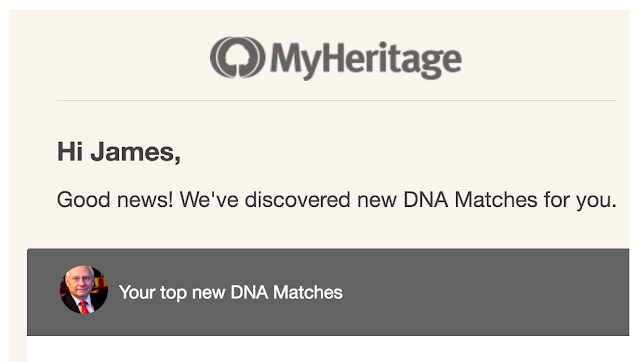 I regularly get new DNA matches by email from MyHeritage.com. Recently, I began to see matches from Australia. This is interesting because two of my direct ancestral lines originate in England and come through Australia. I have had direct contact from some of my Australian relatives in the past, but it is interesting and helpful to find some new ones, especially those that share their DNA and have family trees on MyHeritage.com. Of course, I will have to determine if I want to contact any of these relatives, but it reassuring to see that my research is substantiated, in part, by the DNA test. 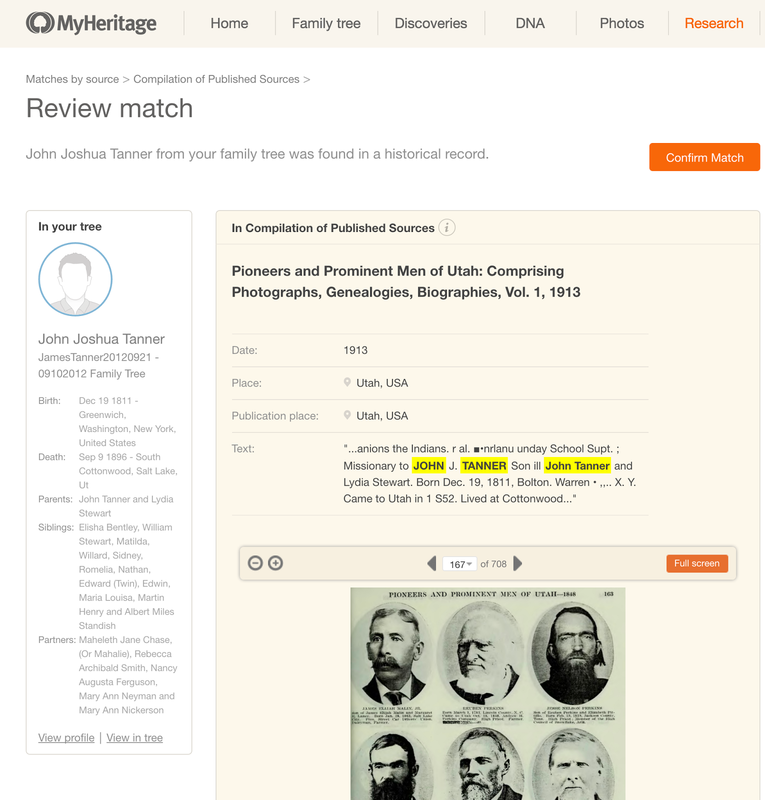 Those users who are adding Record Matches from MyHeritage.com to their family trees have been provided with a new citation feature. Above is a match for one of my Tanner relatives to a book called "Pioneers and Prominent Men of Utah: Comprising Photographs, Genealogies, Biographies, Vol. 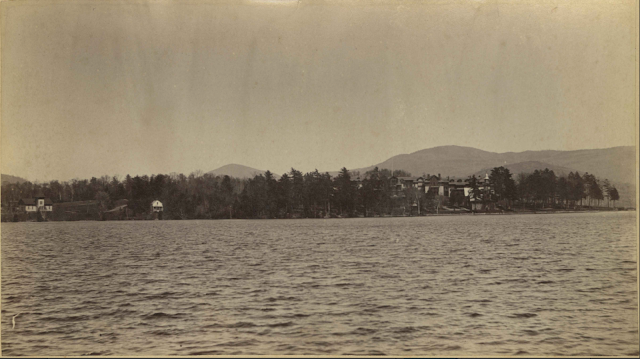 1, 1913." When this Record Match shows up on the website, my first step is to evaluate the match and determine if it applies to my relative. I can then either confirm the match or reject it. By the way, at the same time, I got an additional 30 related Record Detective results. There is really no excuse for those with MyHeritage.com family trees to have entries that are not supported by sources. Of course, you still have to evaluate the sources to make sure they apply to your relative or ancestor, but that is relatively easy when you can compare the information you have with any new or missing information from the suggested source side-by-side. Once I determine that the suggested source applies to my relative, I can then make the comparison and extract the information for my family tree. At the bottom of the right-hand side document comparison, there is complete source citation information. You can then use this to fill in the blanks for other genealogy programs you may be using or to create a more formal citation format for other purposes. There is also a provision to save the entry to another person. In the past, online family trees have been notorious for their lack of substantial documentation. There is really no excuse now for those on MyHeritage.com not to have extensive documentation. Where are the rest of the records? With the overwhelming number of digitized, genealogically significant records going online almost daily, we might have a tendency to believe that "everything is being digitized." This impression is far removed from reality. What is out there that we have yet to identify, catalog, digitize and index? I live here in Provo, Utah, home of the largest private university in the United States, and predominantly inhabited by people who appreciate the importance of records. Are there still significant numbers of records here in Provo that need to be digitized both for research and preservation? Absolutely. The L. Tom Perry Special Collections Library preserves and houses materials requiring regulation. Because of their uniqueness, value, or fragility, these materials are given great care to protect them from damage or theft and to ensure their proper long-term use. Hence, Special Collections acquires, preserves, and makes available for use printed materials (280,000 books, pamphlets, prints, etc.) and a vast array of items comprising manuscript materials (8,000 manuscript collections including diaries, journals, papers, music scores, university records [including records of retired faculty], and 500,000 photographs). I am not picking on this particular university, there are approximately 24 public and private universities and colleges in the State of Utah, not counting those operated for profit. Each of those schools has a library and it is almost certain that there are significant portions of the books, documents, and records in those libraries that have yet to be digitized or preserved. I use this only as an example if you extrapolate this fact across the United States to all of the colleges and universities, approximately 4,000 or so, you can imagine the number of documents, manuscripts and other records that remain on paper and researchable on at each of these institutions' libraries. We delude ourselves if we think that the process of digitizing all the world's records is in anything more than its infancy. I have another illustration from here in Utah. This past week or so, I was asked to look for a copy of a book containing the reports of the cases from the Supreme Court of Utah. I have been used to using digitized case law for many years. But I was surprised to find that the particular volume from the early 1900s was not readily available online. One of the very, very few losses I have suffered as a result of retiring from my law practice was losing access to the online legal database programs such as WestLaw.com. I was surprised that these early Utah Supreme Court cases were not readily available online. I did locate a copy in the BYU Special Collections Library, but in this particular case, the researcher that asked the question found a copy online in the HathiTrust.org. The HathiTrust.org is a partnership community of universities and colleges in the United States that provide digital, online access to their library records. Surprisingly, Brigham Young University is not listed as a partner and the number of partners is far fewer than the more than 4000 such institutions in the United States. So, any genealogical researcher who claims to have done a reasonably exhaustive search of existing records would have to have spent a considerable amount of time in a significant number of special collections libraries depending on the area of the United States where the research was being conducted. In reality, I suspect that no individual during an entire lifetime, adequately review even a small portion of the records available in the United States that are still on paper and uncataloged, unindexed and undigitized. If you expand this view of records to local public and private libraries, historical societies, museums and other repositories, you can begin to see the vast scope of what is left to digitize in the United States alone. I cannot tell you how many people have come to me and claimed the "they have looked everywhere for records of their ancestors" and after I asked if they had searched in newspapers, special collections, historical societies and elsewhere, have come to realize that their research had only just begun. As genealogists, we need to become more aware of the records around us and become knowledgeable about the need to digitize, index and preserve these valuable records. As a community we need to become more proactive is facilitating the digitization and preservation of the existing records. I will refer you again to the post entitled, "Preserving Historical Records: Lesson of the National Personnel Records Center Fire." While every effort has been made to select and present material in the public domain, some materials, particularly State Agency records, may be protected by the copyright laws. 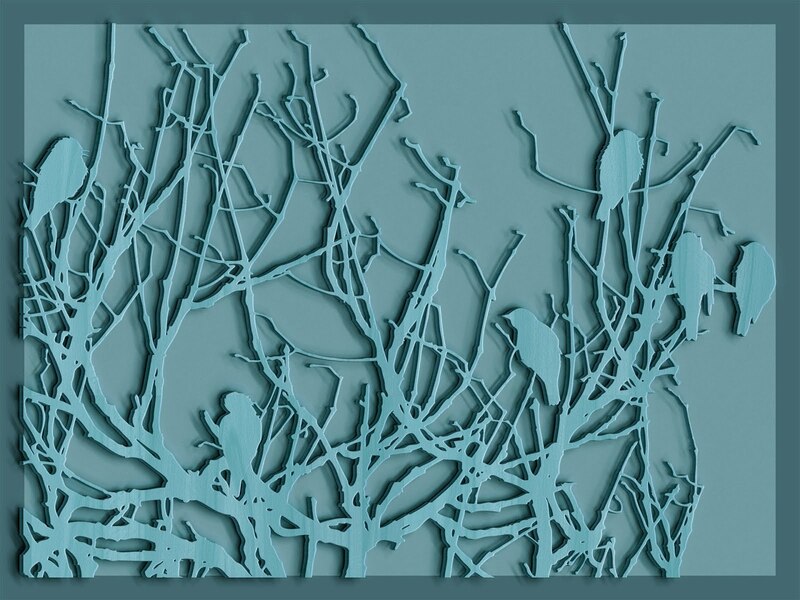 The nature of these materials may make copyright difficult or impossible to determine. When known, information on permissions is noted. The written permission of the copyright owners and/or other rights holders is required for distribution, reproduction, or other use of protected items beyond that allowed by fair use or other statutory exemptions. Responsibility for securing any necessary permission ultimately rests with the user. Please note: This website contains high quality images from the New York State Archives, New York State Library, and New York State Museum. If you wish to receive high quality copies of images from the other repositories represented, you must request reproduction from the institution listed for each record. 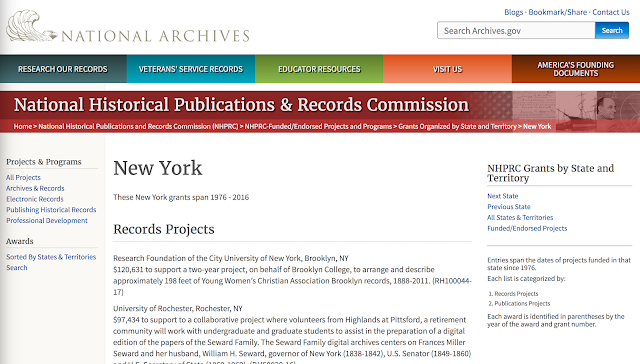 Credit Line: Material on this website is drawn from the resources of the New York State Archives, New York State Library, New York State Museum, and a variety of project partners. Please carefully check each image, text, or other material for the appropriate credit line. The Office of Cultural Education is eager to hear from any copyright owners who are not properly identified so that appropriate information may be provided in the future. Please contact us at archinfo@nysed.gov. This is a very fair and reasonable statement of the possible issues arising from copying items online. One import statement is the need to provide attribution for anything copied that is not specifically noted to be in the public domain. However, for research purposes, genealogists should not only be aware of the need for attribution but should also be providing detailed and complete citations for each record used for making historical conclusions. We should all be providing a clear explanation of our conclusions and providing complete and very adequate references or citations to the place where the records or documents can be viewed or obtained. In short, failure to give attribution is not simply a matter of courtesy, it can be part of the copyright law of the country. Items in the public domain are exempt from this requirement, but all other materials copied should be carefully cited according to the particular requirements of the originator of the work. Going back to the digital collections online from the New York State Archives, they have several ways to search their collections: Browsing by Collections, by Places, by Repositories or by State Agencies. Stay tuned for a more detailed analysis of the contents in the next post in this series. What is a genealogically significant document? By focusing on a narrow topic, such as the lineage of a single family, genealogists tend to be rather parochial in their consideration of where and how to find information. In fact, in my experience, genealogist are not only parochial, but also provincial in doing their genealogical research. I have written in the past about the extreme manifestations of both of these attitudes but since this subject comes up frequently, I seem to always return to say more. The two most common manifestations of these attitudes are the tendency of genealogical research to focus on an extremely narrow and confined definition of "genealogically significant documents" and their tendency to avoid any records or documents that take effort either to decipher or to find. For example, I find very few researchers who use books or microfilm. Because of the vast number of records that have been digitized and are available in some form online, they seem to feel that unless a document is readily available on one of the huge, online, genealogy database websites, then it is too much trouble to go any further. They then complain about their genealogical "brick wall." OK, there are exceptions. I know a few really talented and dedicated researchers who have traveled all over the United States and the world looking in libraries and record repositories for records about their families. But even in the relatively very small community of persistently active researchers, there are only a few that make any effort to break out of the confines of the online digital records. Part of the reason for this insular view of genealogy comes from an inability to visualize their ancestral families in their historical context. Genealogical research becomes a simple task of adding a name, a date and sometimes a place. We are rewarded for the number of slots we can fill up on our pedigree. Now, I have to point out that I live in many different genealogical sub-communities and depending on your own background and experience, you will either consider me to beneath your notice because I do not have the "credentials" of a "real" genealogist or at the other end of spectrum, I become an elitist who refuses to see the perspective of "common genealogist" and their concerns and limitations. Have you searched the tax records? Have you search livestock brand records? Have you considered mortuary records? What was the religious affiliation of your ancestors? The list could go on and on. The last question I listed, about religious affiliation, is one that indicates best the attitude of the researcher. I am not talking about people who are just beginning to do genealogical research. I am talking about people who are not open to suggestions that they will have more success if they take the time and make the effort to search beyond the obvious census and civil registration records. Of course, I am also pretty much aware that these same people will probably never read a genealogy blog. So what is the definition of a genealogically significant document? 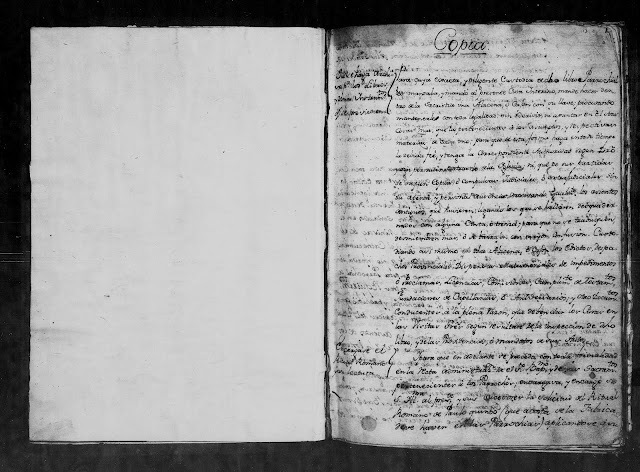 My answer is that a genealogically significant document can be any document that was created during the lifetime of the ancestor and has any possible connection to the place where the ancestor lived without consideration as to the category of document. Until you understand the social, political and cultural context of your ancestors' lives, you will not be able to identify genealogically significant documents. What do Siri, Google Home, Amazon Echo and Alexa have to with Genealogy? The answer to the question posed in the title of this post is simply this: almost nothing! 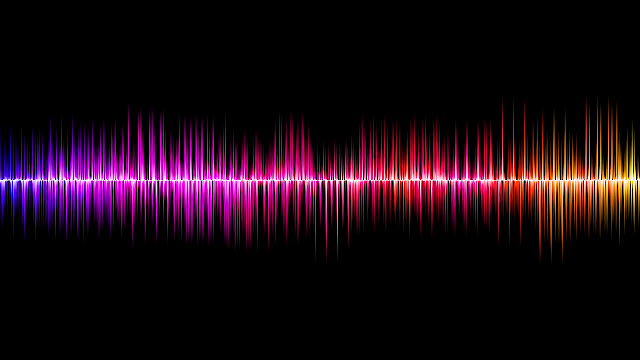 I have recently written about my long involvement with voice recognition or VR software and since my latest return to using this software, I continue to be impressed with the improvements in the software's accuracy and utility. However, VR software, such as Dragon Dictate on my Apple devices, is not the same as the voice command devices listed in the title to this post. Genealogy is a highly involved and complex pursuit involving intense research into historical documents. Part of the research process involves documenting and recording our discoveries. Some genealogists also spend a great deal of time teaching, writing and presenting online and in person. These activities could be done with a piece of paper and pencil, but over the years most writers have moved first to typewriters and then to computers. When I first started practicing law, my father, who was also an attorney, wrote everything out by hand on sheets of yellow paper. When my father retired from the practice of law after nearly fifty years of active practice, he was still writing almost everything he did on yellow sheets of paper with a pencil. When I started, I used voice dictation equipment. I would speak into the dictation machine, actually a specialized voice recording device, and then an assistant (used to be called a secretary) would transcribe the tapes by typing out the words. Then I would review the transcription and make changes and then it would be retyped, sometimes several times. If copies were needed we used carbon paper. When I had been practicing law for a few years, technology began to develop in the form of expensive and rather massive "word processing" devices, such as the Wang Word Processor. Lawyers were not in the forefront of those adopting new technology. But I was fascinated by the possibility that I could speed up the process of producing written documents. This could turn into a long story. To summarize, I tried every level of word processing program that developed. I tried to get the other attorneys around me to change and finally, after nearly thirty years of practicing law, many attorneys had started to use computers in their document processing activities, but most relied on their legal assistants and were still dictating documents. Now, fast forwarding to today, I write even more than I did during my law practice and I am still looking for ways to be faster and more productive. Voice recognition software has the promise of achieving more productivity and greater speed, but it is still, even with the advances, more like a cranky and willful child than an experienced assistant. Right now, for example, I am using my keyboard to type this post. Why aren't I using voice recognition? Because I have a cold and cannot talk. Hmm. There seems to be something missing here with the whole technology advancing aspect of our modern world. Now, what about voice controlled devices? Obviously, they are a boon to those with limited mobility. But don't mistake these devices for advances in productivity. They are billed as convenience devices. My experience with Apple's Siri is an example of why these devices do not assist me as a genealogical researcher. The Siri program simply cannot do anything I need done. I do know a lot of people who use voice command devices regularly. I just don't happen to see the need. I can turn on lights with a switch and not have to think about the process. I do not want my devices talking to me and distracting me from my work. I have enough interruptions as it is. In analyzing the whole development of voice controlled devices, I am reminded of the time when the more affluent members of our society had human servants. As genealogists, we are reminded of this every time we discover a family on a census record with one or more seemingly unrelated family members who are sometimes identified as servants or farm laborers. I come from a more independent background. I would rather do for myself. The main reason I like computers and the internet is that they actually do something productive, not just something convenient. They are tools that extend my own capabilities. To illustrate what I mean, I would refer you to the complete list of Amazon's Alexa commands. See "The complete list of Alexa command so far." If you look at what this "amazing" device can do, the commands fall into several categories: turning off and on music or media, telling you the time and date, recording lists, turning on news and weather, finding restaurants or simple questions about music, doing simple math, asking about sports, ordering from Amazon. Now, if you want to spend thousands of dollars, you can also have these devices connected to even more "smart" devices and run the lights, heating and cooling and other parts of your home. Guess what? None of those things help me to do anything I need done. Not one of those things help me with my genealogical research, in fact, they are mostly a distraction. So, when I am writing and talking about voice recognition software, I do not include voice controlled devices. 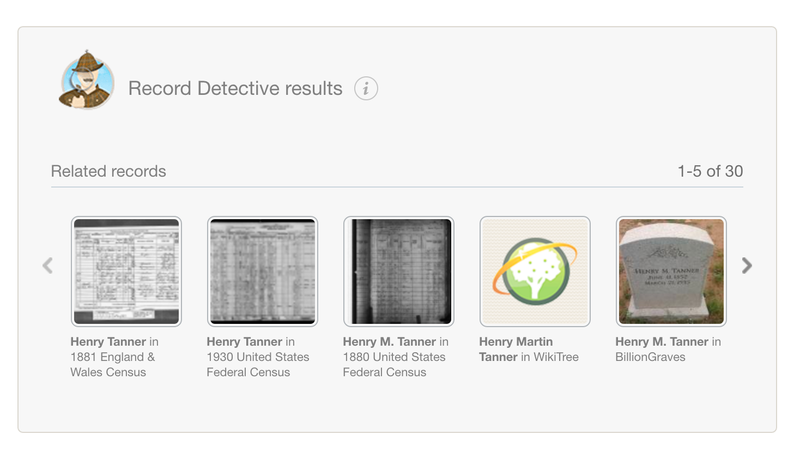 As an experiment to illustrate my point, ask Siri or Alexa to open your genealogy program and search for your great-grandfather. 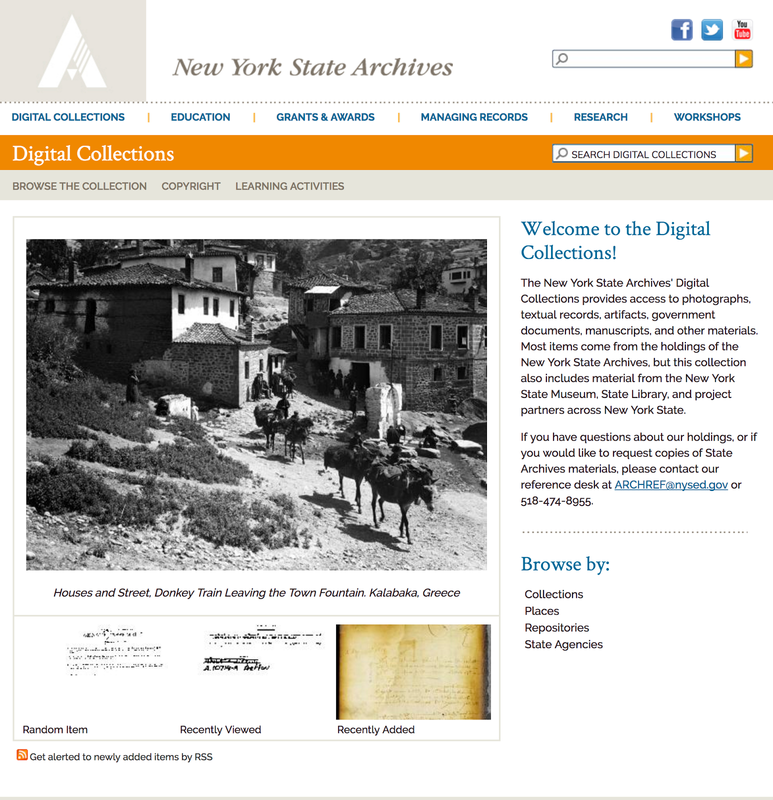 Considering the amount of digital material that is appearing online, if you are contemplating visiting any archive, including the New York State Archives, it is a very good idea to do all your homework online in advance of your visit. It can be very disappointing to arrive at the archive and find out that the records you need have been digitized and made available online and the originals copies are no longer available for examination. This can happen because of the fragile condition of the original documents. Fortunately, many of the archives around the world are making their collections available online. But there are still very substantial numbers of documents that are unique and only available for inspection by an onsite visit. If you finally decide that a physical visit to the archive is necessary, make sure you fully understand whatever rules pertain to your visit and which records you would be allowed to copy and which records would not be available except through obtaining special permission. New York State Archives has its own Research Room Rules as do all of the other record repositories in the world. It is heartbreaking to arrive at the entrance to the archive and find that it is closed for some local event or holiday. In many cases with archives and university and college special collections libraries, the shelves holding the material are "closed" meaning you have to request access to each item you wish to examine and wait while an archive employee retrieves the items. Many times, you will be required to examine the items in an enclosed area called a "reading room" or similar title such as a research room. Access to the reading room or research room and the items you can take with you into these facilities are regulated. 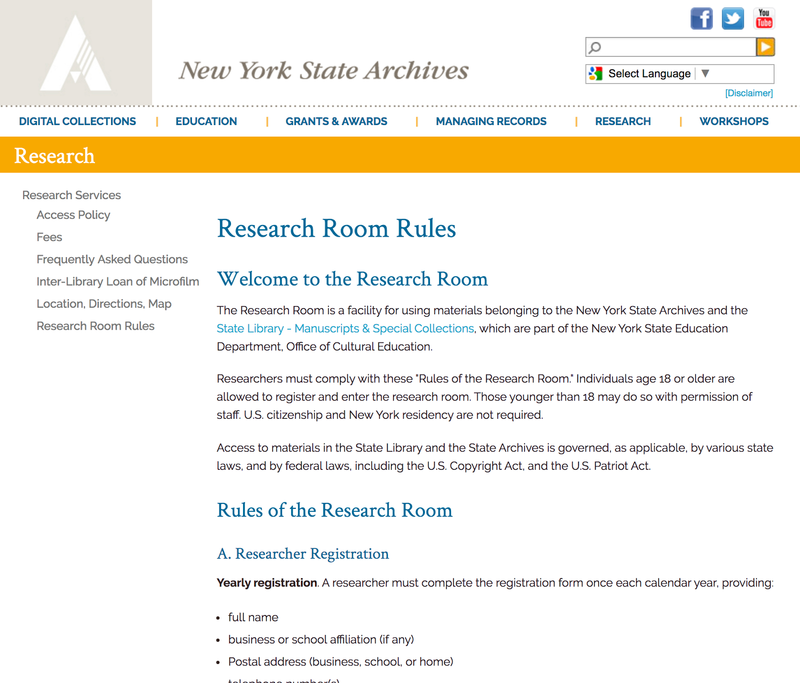 Just for an example, here are the items which are permitted and not permitted in the New York Archives Research Room. Reasonable accommodation. A researcher may ask staff about arranging for a reasonable accommodation for a medical need. With these types of rules, some of the archives provide lockers to store personal items while accessing the reading rooms or research rooms. More importantly, access to some or all of the collections in an archive may be limited to accredited researchers. In some cases, access is limited to those who have pre-registered and allowed access. From this fact alone, you can see that planning your visit is absolutely necessary. All of these rules are a good incentive to make sure the items you need are not already available somewhere online. Based on population, New York is the fourth largest state in the United States. However, it still has a population greater than many of the world's countries. Its population would make it the 59th most populous country in the world if it were ranked as a country. Just for interest sake, the other three states with larger populations, in order, are California, Texas, and Florida. of records that pertain to New York State. Here is a sample of some of the online records. I list cemeteries as first in importance because so many people have lived and therefore died in the state over the years. Of course, you should always check the huge cemetery database programs, but here is a list of those plus a few more dedicated to New York State. Previously mentioned the New York State Census records that are available from 1825, every ten years to 1875 and then again in 1892, 1905, 1915 and 1925. Both FamilySearch.org and Ancestry.com have the state censuses from 1855 onward. The earlier state census records are available from the website of the New York State Library on a web page entitled, "Census - New York State." These types of records can be found scattered online in websites from digital newspaper websites to local genealogy society websites. This is an area of genealogy that defies generalizations. In every case, you are looking for a specific record. For some assistance, you can see the FamilySearch.org Research Wiki article entitled, "How to Find United States Birth Records." 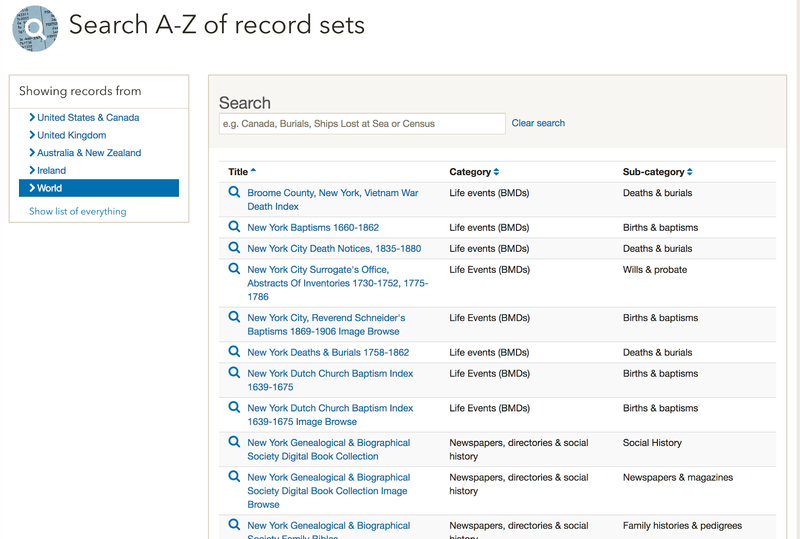 There are similar articles on the other components of the vital records category. For a more general starting point, you can also begin with United States Genealogy in the Research Wiki. 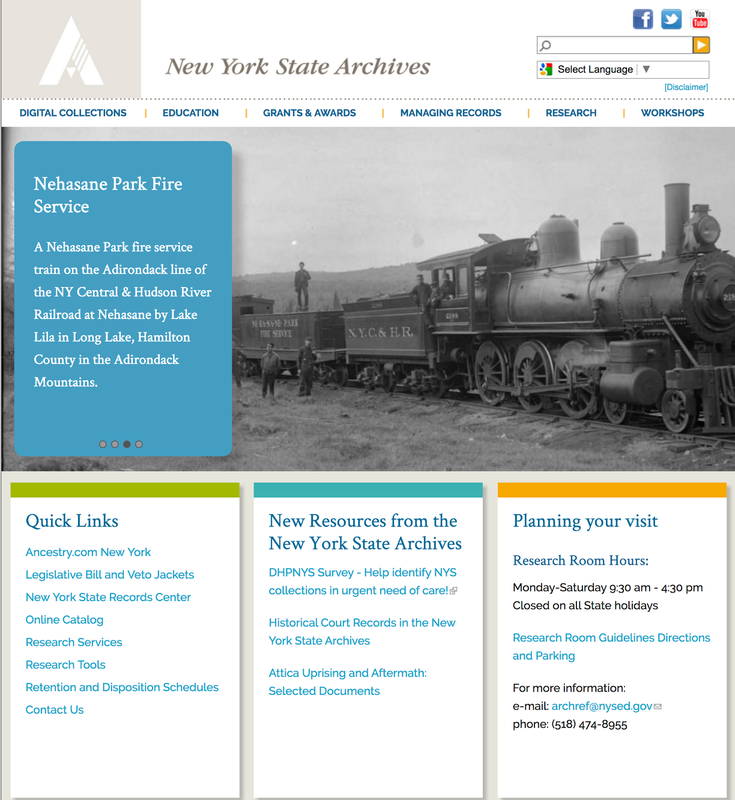 Here are a few of the websites with lists of New York State online websites excluding the large websites such as FamilySearch.org and Ancestry.com. The more you look the more you will find. The Milstein Division of United States History, Local History & Genealogy is one of the largest genealogical collections free and open to the public. Following is a selective list of resources, with an emphasis on New York City. Unless noted, all sources are located in the Milstein Division (Room 121). Many of the microform titles are self-service in the Milstein Microform Reading Room 119. 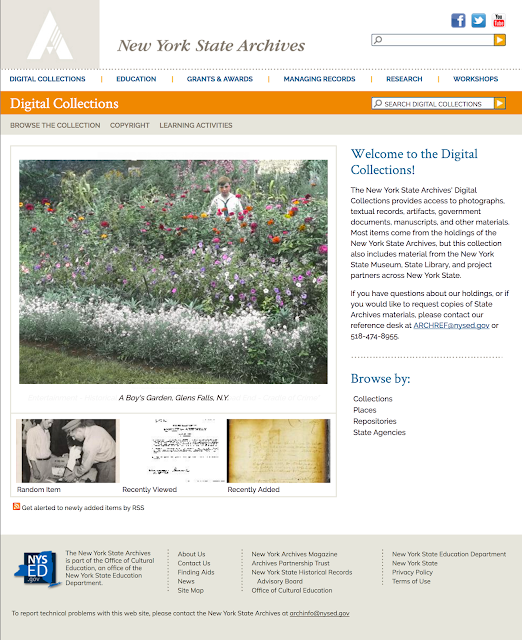 As with many of the major libraries in the United States, their online digital resources are available primarily only to patrons who are physically present in the library. In some cases, remote access can be obtained by having a library card or paying an extra fee. It is important to review the list of resources because it may well be that many of them are available either in your local library or in a Family History Center. Searching the catalog for items of interest may be beneficial in making a decision as to whether to travel to the library for on-site research. 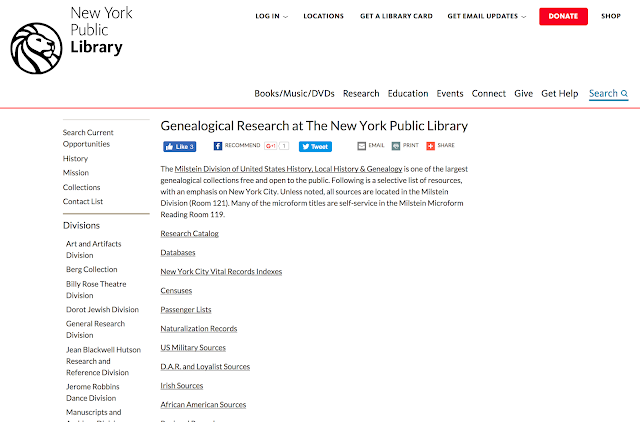 As is the case here with the New York Public Library, some of the databases listed are subscription-based and free access is granted for searches made within the library itself. As a comparison, there are only a few items listed on the New York Public Library website that are not also available through the Brigham Young University Family History Library in Provo, Utah. However, from a researcher's standpoint, the items that are not generally available may be worth a trip to the library. The Milstein Division's book and serial collections are supplemented by materials in other formats. Visual resources include photographic and negative collections, primarily of New York City views, and over 100,000 postcards documenting United States local views. A local history ephemera collection of provides primary study materials for the cultural, social, and religious history of the United States. The Milstein Division also collects political campaign ephemera, including broadsides, and pamphlets. Vertical files and genealogical charts further enhance the holdings of The Irma and Paul Milstein Division of United States History, Local History and Genealogy. When confronted with a description like this, the genealogical researcher may feel like he or she is going on a fishing trip without knowing whether or not the fish are in the lake. The NPL also has over 300,000 e-books and audiobooks available to library cardholders. Genealogists are not being discriminated against. 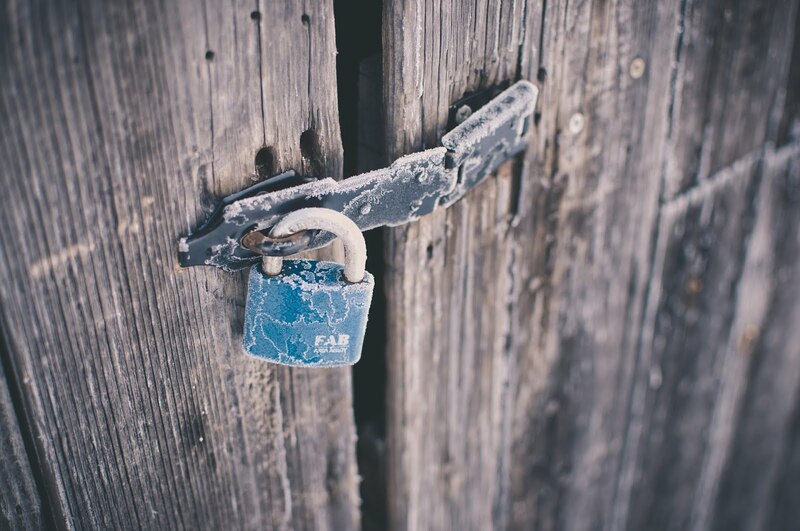 Every library in the United States has some restriction on access by the general public. Most Access restrictions focus on property ownership within the area served by the library. In addition, many other libraries such as the NPL, require residency in the state of New York but in order to obtain a license or library card, you must live, work, attend school or pay property tax in New York State. Have you noticed that the vast majority of the disaster and monster movies focus on New York City? For genealogists who like to watch those kinds of movies, this highlights the importance of the records found in the Empire State. The first European land claim to the area that is now New York State came in 1609 from Dutch explorers. In 1626, the Dutch "bought" the island of Manhattan from some Native Americans. Stories from this time period focus on the low price paid for the land, but there are also speculations that the Natives did not "own" the land in the first place and so the transaction set the stage for the long history of land speculation and commerce in the area. England eventually pushed the Dutch out and renamed the land, New York after the Duke of York who later became King James II and VII. 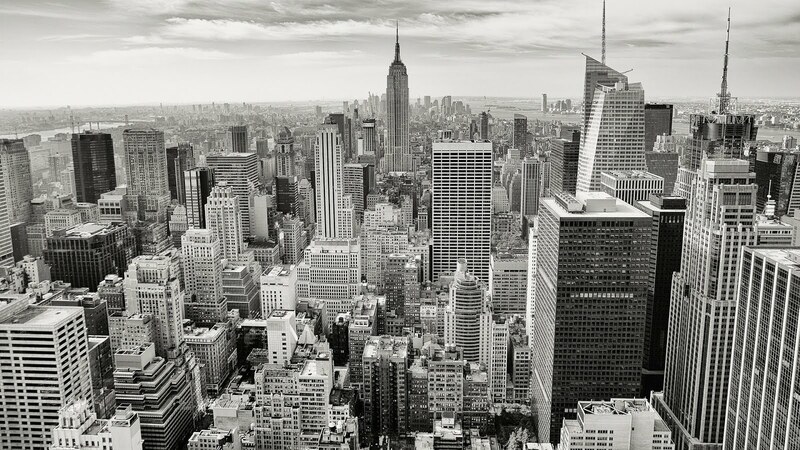 See Wikipedia: History of New York. FamilySearch.org has 50 collections of free records from New York State going back to land records as early as 1630 and probate records beginning in 1629. One definite benefit to genealogists is the existence of New York State Census records beginning in 1825 and continuing in 1835, 1845, 1855, 1865, 1875, 1892, 1905, 1915 and 1925. These are particularly significant because of the loss of 1890 U.S. Federal Census records. The vast New York Public Library has a huge and important collection of genealogical records. 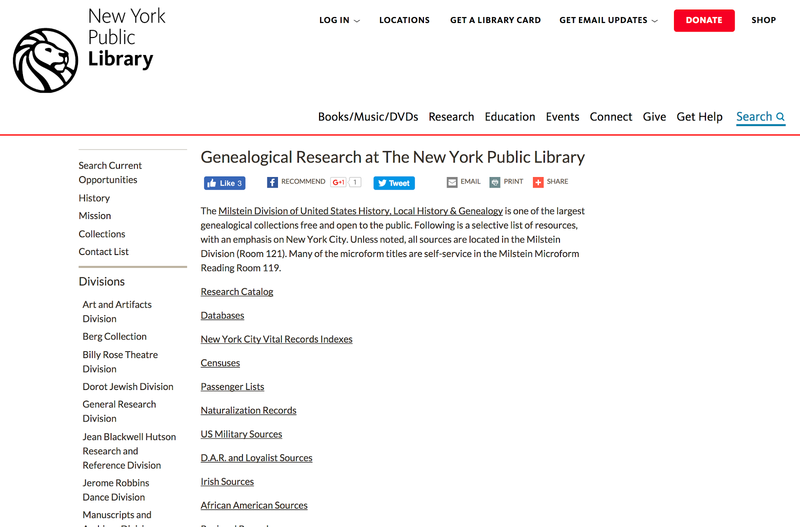 See Genealogical Research at The New York Public Library. 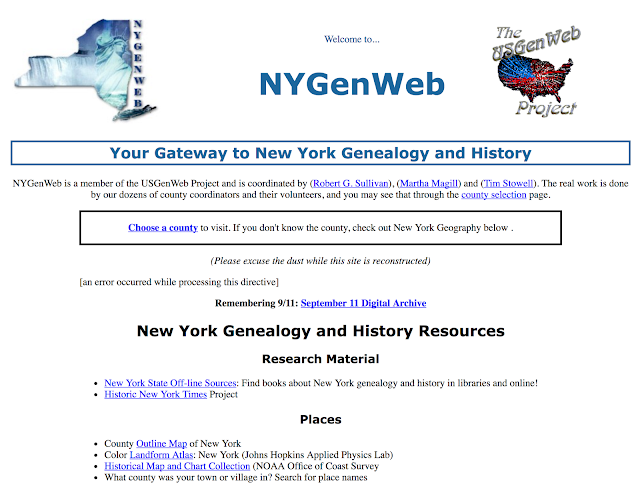 A convenient list of New York counties and a summary of their genealogical records in on the New Horizons Genealogy website's "Search Free New York Genealogy Records Online." Repeated Google searches for New York genealogy records will produce listings to hundreds of useful websites. It is highly unlikely that any one researcher could do an exhaustive search of all of the records in New York State even those that are available online. For many researchers, the immigration records from locations in New York are extremely valuable. From 1820 to the opening of Ellis Island in 1892, approximately 11 million immigrants came through Castle Garden on the tip of Manhattan Island now known as Castle Clinton National Monument. The free CastleGarden.org website has a searchable database of these 11 million immigrants. 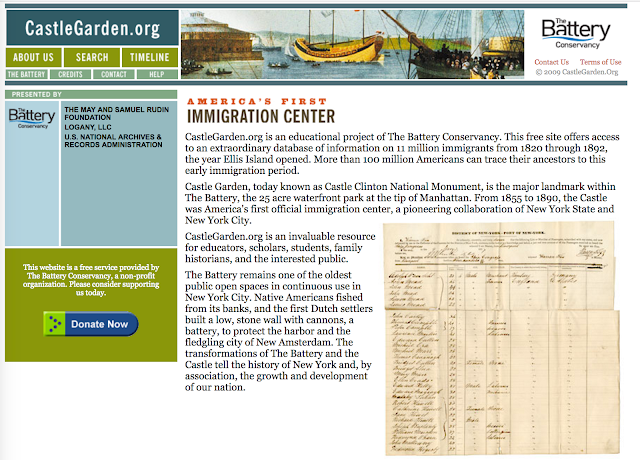 Castle Garden was replaced as the immigration processing center by the opening of Ellis Island in 1892. A searchable database of approximately 52 million passenger records is maintained by The Statute of Liberty - Ellis Island Foundation Inc. However, researchers should be aware that many other ports of entry existed in the United States and searching immigration and passenger lists can sometimes require some rather extensive genealogical detective work. For example, one of my own immigrant families entered the United States in Passamaquoddy, Maine. 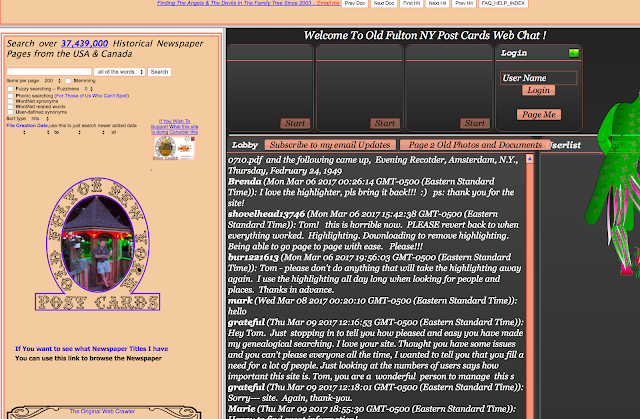 One unusual and interesting website is the Old Fulton NY Post Cards website with over 37 million pages of historical newspapers from the U.S. and Canada, including New York State. Although this website is rather strange, it is useful. 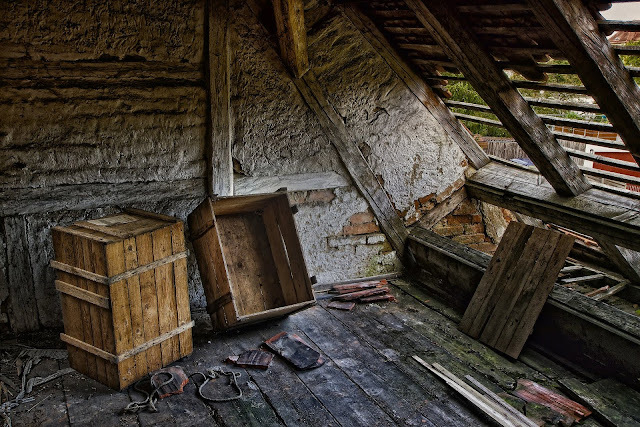 Some 630 million items in collecting institutions require immediate attention and care. Eighty percent of these institutions have no paid staff assigned responsibility for collections care; 22 percent have no collections care personnel at all. Some 2.6 billion items are not protected by an emergency plan. 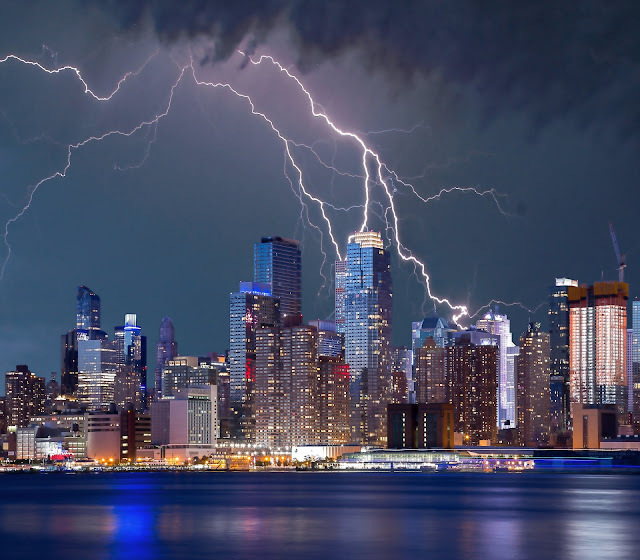 As natural disasters of recent years have taught us, these resources are in jeopardy should a disaster strike. Personal, family, and community collections are equally at risk. ALA encourages libraries and other institutions to use Preservation Week to connect our communities through events, activities, and resources that highlight what we can do, individually and together, to preserve our personal and shared collections. From my own perspective, the American Library Association is vastly underestimating the number of records and the challenge. This is a substantial example of the need for genealogists worldwide to become proactive in the area of document preservation. Individually, we can take this as a good opportunity to look around in our own neighborhoods, cities, counties and states or provinces to see what can be done to support the preservation of records that are already in libraries and archives. The genealogical impact of New York cannot be underestimated. A very high percentage of all the immigrants who came to America either settled in or passed through New York on their way to living in America. This fact alone makes New York State a prime area for broad interest among genealogists. There is probably no way to completely enumerate all of the genealogically significant records available in the entire state without writing an entire book and even if that were to be done, the book would almost instantly be out-of-date. However, there are some of the major genealogical resources that can be highlighted and that should not be overlooked. There are already a number of lists of such resources available. 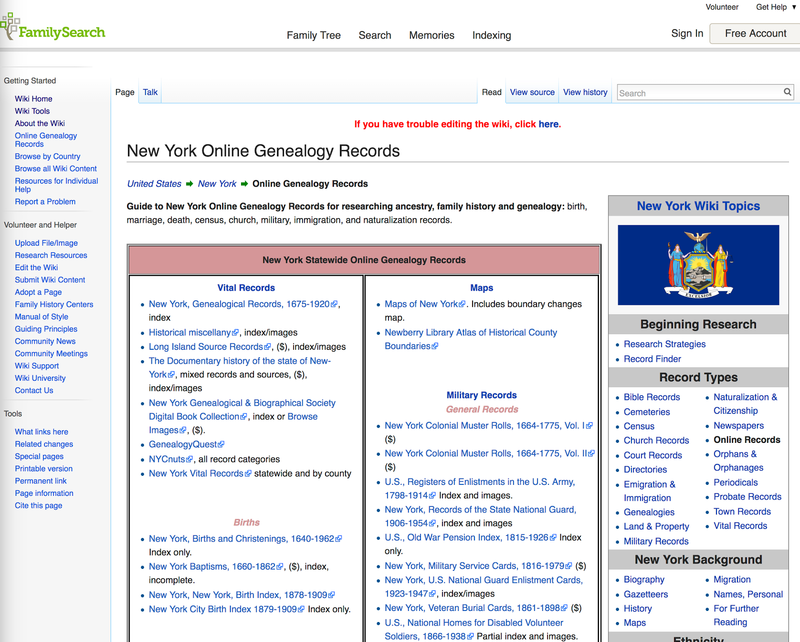 The FamilySearch.org Research Wiki has a rather long list in an article appropriately entitled, "New York Online Genealogy Records. " Ancestry.com has an extensive list of genealogical records from New York State. 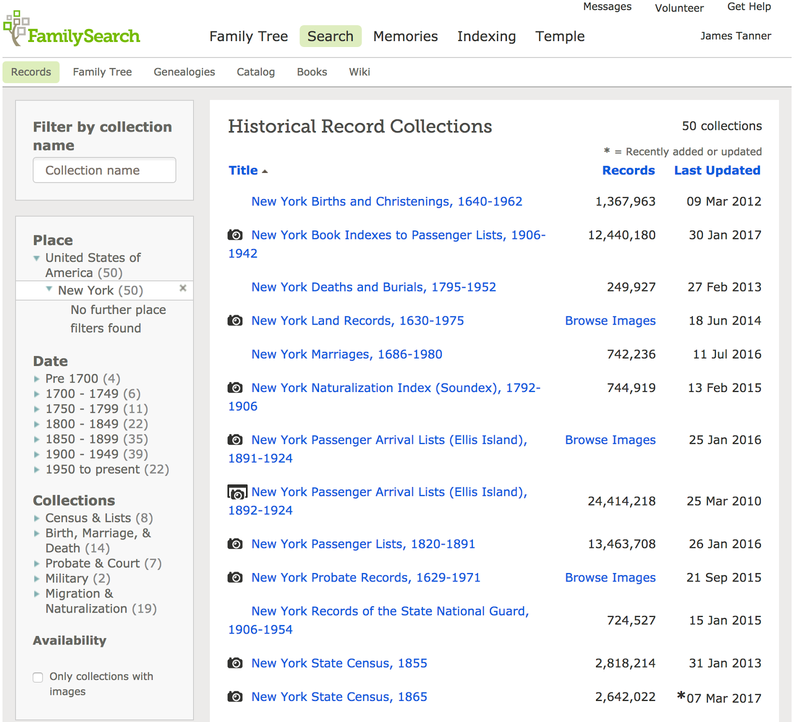 If you look at the Ancestry Card Catalog and filter the results for New York records, you will find over 10,000 collections of records with information about people in New York. In addition, Findmypast.com also contains significant collections of records from New York. The list goes on for pages in the A-Z list of this website's record sets. In fact, almost every large online database of genealogy records will likely contain valuable records from New York State and some of those records will probably be unique. The New York State Archives has another huge online collection of records. There is really no adequate way to determine the total number of records online in any of these large collections and in any event, the numbers would increase almost daily. Here is a screenshot of the directory for the online collections from the New York State Archives. Don't be cheated out of finding the information you are seeking by making superficial, general name searches of all these records. Although name searches are helpful, it is always a better to carefully search each collection of records that could potentially contain information about your ancestors. "Finding John Tanner among the Country Roads and Farms of Greenwich, New York"
"William Tanner Lives Again: A Summary of the Tanner Genealogy in 2014"
It is important, in the context of looking at records for New York State online, to remember that many of those records are in the U.S. National Archives. For example, here is a screenshot of the New York currently existing National Archives Records Projects just for New York State records. Many of these ongoing projects involve the digitization of the records and eventually, these records will make their way online. 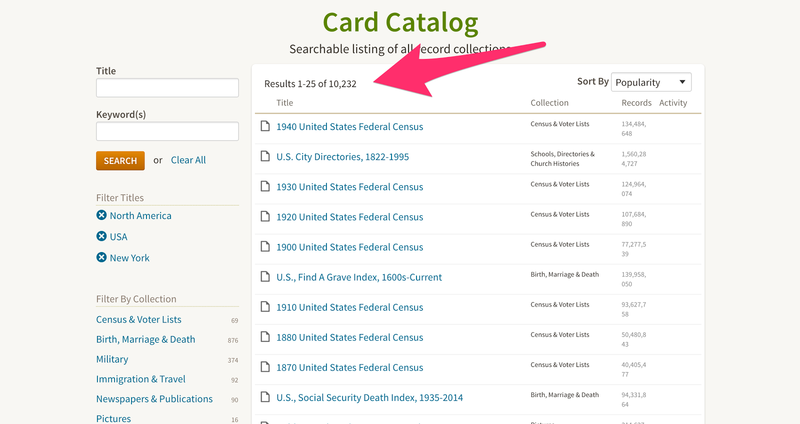 In addition, many of the National Archive's records are already online in the larger online collections on FamilySearch.org, Ancestry.com, and Fold3.com. It is always important to remember that digitization projects are ongoing and there are huge collections of records that are not yet digitized and must be researched in person. For example, here is a description of the records in the New York City, Department of Records. 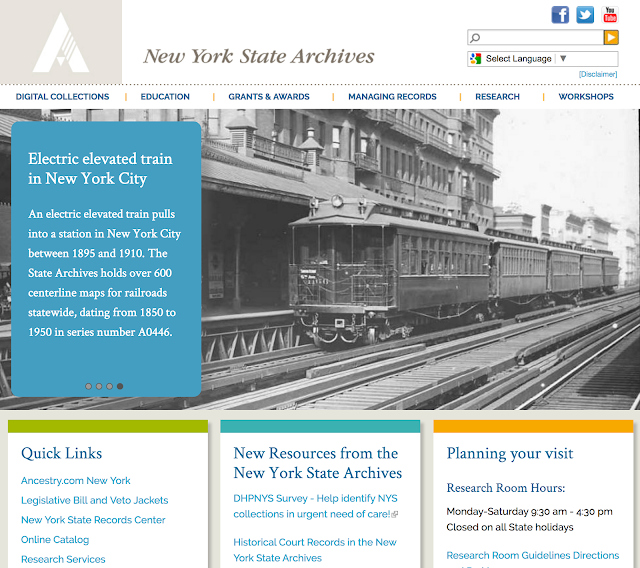 Established in 1977, the Department of Records and Information Services preserves and provides public access to historical and contemporary records and information about New York City government through the Municipal Archives, the Municipal Library, and the Visitor Center. The Municipal Records Management Division operates records storage facilities in two locations with a combined capacity of 700,000 cubic feet, and provides records management services to fifty City agencies, ten courts, and the five district attorneys’ offices. Records services include scheduling, off-site storage and retrieval, and overall guidance on management of records in all media. 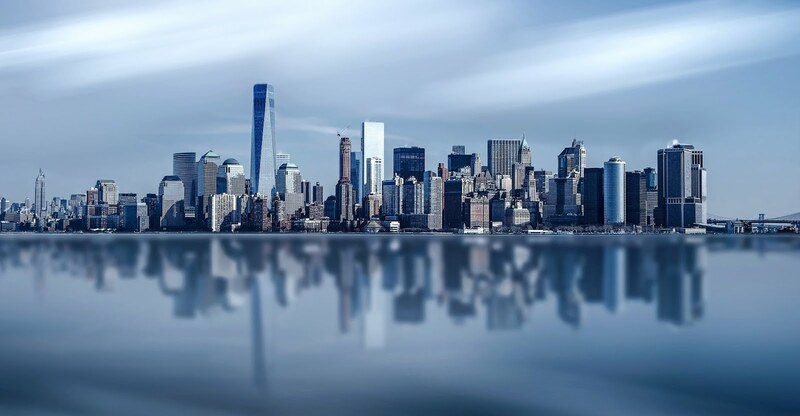 The Grants Administration Unit assists mayoral agencies in obtaining and managing grants from the New York State Archives’ Local Government Records Management Improvement Fund. The potential number of records left to be digitized and made available online is truly astronomical. No research into the online records of New York State should ignore the NYGenWeb website. This series will continue. Stay tuned. It has been some time since I returned to the topic of voice recognition software. My interest in the subject began, as I have written about previously when I attended the Seattle World's Fair in 1962. I saw a demonstration by IBM of a rudimentary form of voice recognition using an IBM Selectric typewriter. Since that time, I have been fascinated with the possibility of being able to talk and have my words transcribed automatically. Subsequently, I have spent quite a bit of money and even more time. using almost every voice recognition program that was developed for personal computers. Hmm. I haven't use the words "personal computer" for a long time. The results have consistently been extremely frustrating. most of the time, over the years, the programs have been cranky and hard to use. The results required more editing time than it would've taken to type out the product in the first place. But, I kept hoping that someone would finally develop a program that would solve the problem of writing constantly. A few years ago, voice recognition finally began to function at a usable level. There were still serious problems but they became manageable. The main limitation on the implementation of voice recognition software was the speed of the ability of the computers to compute. 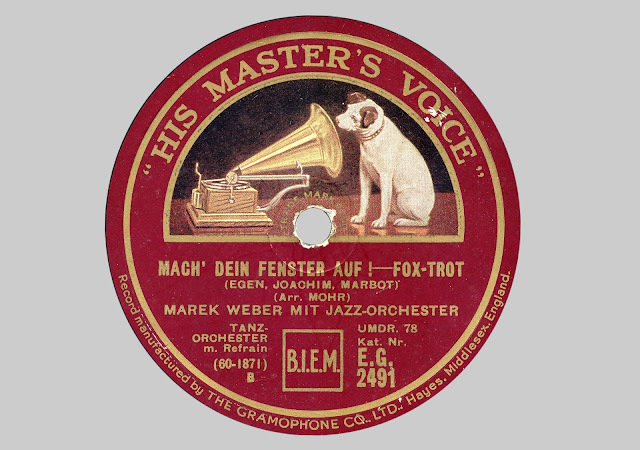 As computers became more sophisticated and faster, voice recognition became a possibility. Finally, I began to use voice recognition or VR more regularly. My use of the program focused on Nuance software's Dragon NaturallySpeaking program. The Macintosh version was called Dragon Dictate. I use the versions of the program for several years, however, I finally balked at the price of the upgrade. I tried to use the built-in voice-recognition function provided by Apple. But it was like stepping back into the past and having to deal with the idiosyncrasies of the more primitive voice recognition software. Ultimately, the number of posts, presentations, and syllabuses that I had committed to do became overwhelming and I bit the bullet and upgraded my existing Dragon Dictate program, Now called Nuance Dragon Professional Individual for Mac. Despite the price, it is nice to get back to dictating posts. It looks like the time saved is worth the money. The newest program, version 6, seems to work flawlessly. The editing functions work well in the program understands a very high percentage of everything that I say. Of course, I have to speak clearly but that is something easily remedied. So, the results of this will likely be an even greater quantity of output. I hope you can stand it. Is Genealogical DNA Testing a Fad? In two of my recent posts, I have referred to DNA testing as a "fad" and received some negative feedback. A fad is defined as "an intense and widely shared enthusiasm for something, especially one that is short-lived and without basis in the object's qualities; a craze." Of course, we have no idea whether or not DNA testing at the level and it is now being promoted will be short-lived. At RootsTech recently, there were long lines of people purchasing a discounted DNA test from Ancestry.com. Both before during and subsequent to RootsTech, I have been talking to quite a few people who are having serious conceptual questions about DNA testing. The questions include understanding the results, applying the results to their own personal genealogical research, and comparing the results of more than one DNA test. On the other hand, there are those serious genealogical researchers who employ DNA testing to specific genealogical objectives. They not only understand the need for a DNA test but also understand the results when they are received. In this case, DNA testing could hardly be considered to be a fad. In addition, the experience genealogists are encouraged by the fact that the pool of potential comparables is increased dramatically as people take DNA tests. This is a very good reason for promoting a wider use of DNA testing. DNA testing is not cheap and there appears to be little motivation for individuals to have more than one DNA test. But when there are multiple DNA tests of the same individual, comparison of the tests creates another level of concern. There seems to be no common analytical basis for determining relationships among the various testing companies. The fact, that we receive a nebulous percentage of genetic relationship to a rather undefined group of people around the world is not particularly helpful for directing specific research. However, when DNA testing is applied to relationships within the first four or five generations, the results can be very helpful in establishing unknown relationships and clarifying previously difficult problems. For example, if a person discovers that his or her parent is not a biological parent, then this obviously opens up an entire area of investigation. DNA testing has the potential of reconstructing basic family relationships which were unknown prior to the test. As many of the disclaimers used by the DNA testing companies state rather clearly, the effect of these tests on immediate family relationships can be unsettling and in some cases devastating. In short, in many cases, taking a DNA test may produce extremely disruptive results. For the past year or so, DNA testing has been an almost constant topic of conversation. For those with families that do not follow traditional pedigree lines, DNA testing has opened up a new world of a potential resolution to previously unresolvable family relationships. But for those who fall into the general pattern of family relationships, the DNA test merely confirms what was already known. If the pool of comparables increases dramatically, as it probably will, then in the future, DNA testing will become a standard adjunct to the initial creation of a family tree for any individual. But I would suggest that as the use of DNA testing by genealogists changes and matures, it will begin to move out above the realm of something that could be considered a "fad" and become merely another tool for use in the course of doing genealogical research. During the past year or so, I have been reading and studying about genealogical DNA testing. Of course, I do not have degrees in any related subjects, but as a trial attorney, I have spent my adult life learning enough about a variety of subjects to represent clients in serious litigation issues from airplane crashes to complex real estate transactions. So I am not an expert. Were I still practicing law and faced with a court case involving the DNA issues, I would advise my client to hire an expert witness. But in order to prepare for a trial, I would have to understand enough about the subject to ask intelligent questions and perhaps discredit an opposing party's DNA expert. I think I have gotten to that point in my understanding. 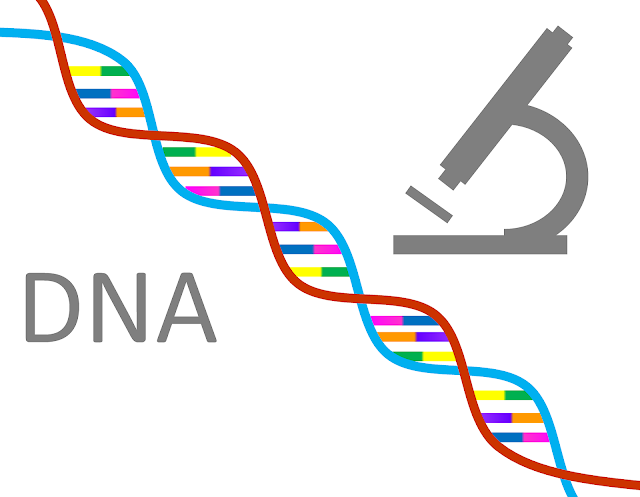 I feel that I have a basic understanding of both the strengths and weaknesses of genealogical DNA testing and if confronted with a complex issue, I can find documentation and explanations for possible issues that might arise. One disturbing issue with genealogical DNA testing is the mixed results obtained by genealogical researchers when the results of tests from different DNA testing companies are compared. It is not necessarily an issue with the accuracy of the testing processes, but it does raise some serious concerns about the methodology and reporting processes between the different companies. Were I faced with a litigation issue based on a claim from an opposing party involving the results of DNA test, I would immediate request that another test be taken from a different company and I would expect that the results would be different enough to greatly weaken any claims being made on the basis of only one test from one company. Genealogical research involves the process of examining historical records for information about ancestral origins. Relationships are discovered through existing documentation pertaining to deceased ancestors. Much of the time, the available documentation is insufficient to be conclusive. The goal of genealogical research, in the main part, is to adequately identify ancestral lines with sufficient documentation to convince ourselves and others of the validity of the conclusions reached. Where there is insufficient documentation, conflicting opinions as to the identity and validity of the ancestral conclusions are common and expected. It is also not uncommon for genealogical researchers to have greatly varying degrees of expertise in both in researching records and in reaching valid conclusions from the existing records. In addition, the larger, worldwide, genealogical community contains a great number of adherents to genealogy and family history that have only a very casual understanding of the historical research nature of the subject. By adding DNA testing to the mix of genealogical research, we are in a real sense, increasing the level of complexity beyond the capability of most of the casual participants. Not only is the pursuit of genealogy complex, but by adding in another, perhaps an even more complex process of determining relationships, we have surpassed the interest and ability of nearly everyone. By making DNA testing a popular and faddish practice, we have imposed yet another level of obfustication and confusion on the larger genealogical community. Comparing admixture results from AncestryDNA, 23andMe and Family Tree DNA by Debbie Kennett. I would also point you to my friend, Louis Kessler's recent article that I previously cited. These two posts are representative samples of the confusion and uncertainty that can arise from multiple tests. The tragedy of this situation is that I am now getting involved questions from patrons at the Brigham Young University Family History Library concerning their DNA tests and the conflicts between multiple tests. My own opinion is that given the results of multiple tests and the lack of corresponding support from traditional genealogical research, there is little basis for relying on DNA tests. Now, it is important to distinguish between the generally nebulous results from a general DNA test and the ability of these tests, coupled with extensive online family trees to find "relatives" in the first four or five generations of a particular pedigree. DNA tests have been now long used by courts to establish paternity and other close family relationships. This is a given fact. But there is no support for extending the same degree of confidence in close familial relationships out to the greater extrapolations made from the general population. As is very well pointed out by Debbie Kennett, the number of tested subjects for comparison are still way too small to provide any degree of accuracy. But when DNA results are incorporated into an extensive online family tree program, there is a rather larger probability that the relationships, inclusive in four or five generations, are reasonably accurate. This situation might change as the number of people taking DNA tests and at the same time having accurate and documented pedigrees increases, but presently we are not at that level of certainty. What's So Vital about Vital Records?